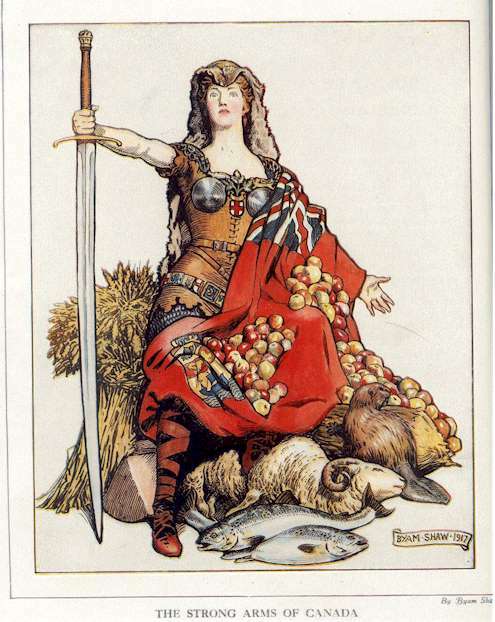 Here's a WWI-era personification of Canada by British Pre-Raphaelite John Byam Liston Shaw. Canada emerges from a heap of emblems representing her economic and martial role in the Empire to strike a Wagnerian pose. The figure herself is straight out of Victorian medievalism, but the bountiful foodstuffs show the influence of the poster art created for the Department of Immigration and Canadian Pacific Railway. I feel Byam Shaw is guessing about the mutton, but Canada was renowned for her cheese, and was a major apple exporter at the time. Wheat and fish are so closely associated with Canada as to be heraldic. The same goes for the beaver, though it appears to be wondering why it's in this tableau, as a symbol of industriousness or the historic fur trade or what. It's pretty easy to see why Canadian art about the Empire gets increasingly ironic from this point forward. It's hard not to think of this gal as a member of a travelling opera company, touring the provinces and soldiering on through the barrage of apples.